Looking for something a bit cooler ... not possible I hear you all say.. An Amazonas Vented Tarp Baseball is the tops...Well now we have a little twist on our original Tarp Baseball Cap, all the style and ruggedness of our original hat but now with vented back panels made from recycled burlap sacking/jute which when hand sewn by our craftsman end up with a Vented Tarp Cap that is truly wonderful. 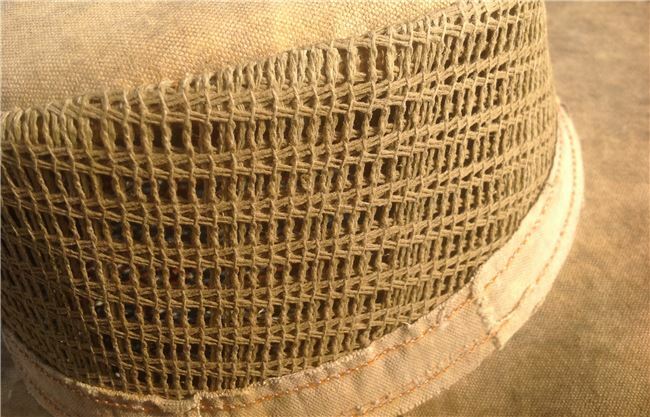 The tarphats vented back fabric is recycled from old sacks used for carrying dried rice and Coffee and black eyed beans to the markets in Brazil, once we have sourced the material it is prepared into a soft but ridged material which blends fantastically with our standard tarp material. They come with a super strong velcro size adjuster to the rear which makes perfect sizing easier. We are all unique so why not reflect this in our clothing rather than wearing the same old same things offered in the high street stores. Sorry there are not any current customer reviews for this item.